Hayes forward Terin Kinsway (5) puts up a shot during a game last season. He’ll be a starter for the fourth straight year this winter. The Delaware Hayes boys basketball team is a pretty close-knit group. If the Pacers are going to get where they want to go this season, though, head coach Jordan Blackburn said they need to be even closer. Shouldn’t be much of a problem considering Hayes returns seven key pieces from last year’s squad. Projected starters include junior guards Nate Griggs and Addison Harvey, senior forwards Terin Kinsway and Jwan Lyles and junior wing Paul Burris. Griggs, who will be running the show at point guard for the third straight season, was an All-OCC and All-District honoree a season ago. Kinsway, a four-year starter, was an All-Ohio performer. 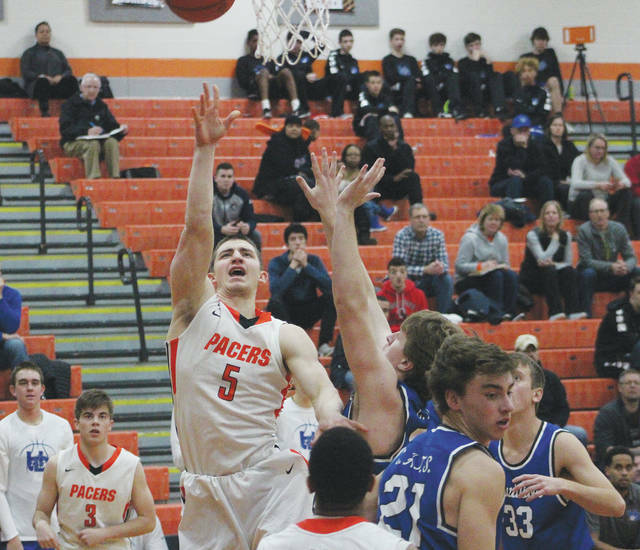 “Nate is one of the best shooters I’ve coached … and he’s as tough and consistent as any guard we’ve had,” Blackburn said of Griggs, who led Central Ohio in three-point shooting percentage last winter. “Addison’s competitiveness is contagious and he’s much more skilled offensively (than last year),” he added. “He sees the floor as well as anyone and is an excellent defender. Other returns included sophomore guard Ryan Smudz, who started eight games as a freshman; and senior forward Jack Weller, a four-year letterwinner. Needless to say, depth is a strength. The Pacers open the season Friday against host Buckeye Valley. Tip is set for 7:30 p.m. Tickets are pre-sale only and those remaining will be available for purchase in the Hayes and Buckeye Valley athletic offices from 7:45 a.m. until 3 p.m. the rest of the week.